One of the emergency residents has just taken an ABG on the 44 year-old woman in cubicle 3. Prior to her current presentation she had no known medical problems. The patient’s pulse oximetry reading is SpO2 98% on air. Q1. What are the possible explanations for the discrepancy between the pulse oximetry reading and the oxygen saturation on the arterial blood gas? Dyshemoglobinemia can also cause a discrepancy between SpO2 and SaO2, but will not cause the decrease in measured PaO2 as seen in this case. In carbon monoxide poisoning SpO2 will read in the 90s despite high levels of COHb — but the PaO2 should still be high. In methemoglobinemia, the SpO2 plateaus at about 86% with increasing levels of MetHb, but again the PaO2 will not be decreased. Q2. What other blood test would be particularly helpful? Q3. Describe the blood test result shown in Q2? Spurious hypoxaemia in this setting is also known as ‘leukocyte larceny’. Q4. 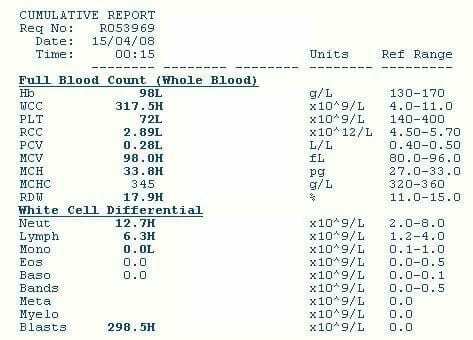 Interpret the blood test result shown in Q2? What is the likely underlying diagnosis? Hyperleukocytosis (>100 x 10E9/L) is almost always due to a hematological malignancy. Blast cells in the blood suggest acute leukemia or a blast cell crisis. The presence of Auer rods in the blast cells would confirm the diagnosis of acute myeloid leukemia. Blast cell crisis occurs when chronic myeloid leukemia (CML) undergoes transformation into a more aggressive condition. Blast cells are immature precursors of either lymphocytes (lymphoblasts), or granulocytes (myeloblasts). They do not normally appear in peripheral blood. They can be recognized microscopically by their large size and primitive nuclei (ie the nuclei contain nucleoli). 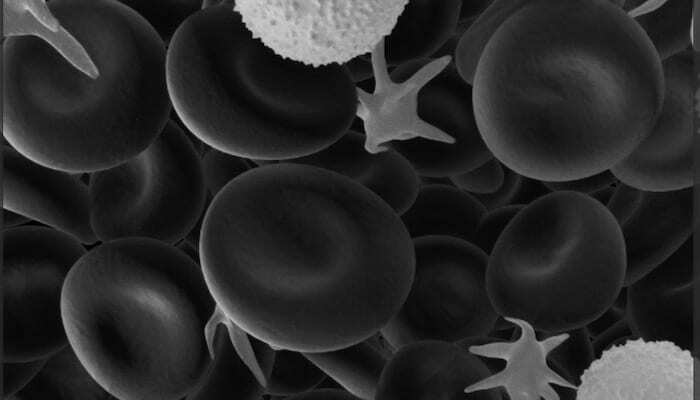 The anemia and thrombocytopenia is consistent with bone marrow failure. Q5. What other complications is this patient at risk of? Note the possible respiratory complications of conditions that cause hyperleukocytosis — measured hypoxaemia may be real or spurious! Q6. What are the treatment options? Q7. How could the abnormal blood gas result be avoided? Note that massive leukocytosis can also result in pseudohypoglycemia due to ongoing glucose metabolism after a blood sample is collected. Cammalleri L, Malaguarnera M. Rasburicase represents a new tool for hyperuricemia in tumor lysis syndrome and in gout. Int J Med Sci. 2007 Mar 2;4(2):83-93. Review. PubMed PMID: 17396159; PubMed Central PMCID: PMC1838823. Lele AV, Mirski MA, Stevens RD. Spurious hypoxemia. Crit Care Med. 2005 Aug;33(8):1854-6. Review. PubMed PMID: 16096465. Sacchetti A, Grynn J, Pope A, Vasso S. Leukocyte larceny: spurious hypoxemia confirmed with pulse oximetry. J Emerg Med. 1990 Sep-Oct;8(5):567-9. PubMed PMID: 2254603.